Fun With Frisian: REEK - "smoke"
Frisian has quite a few expressions that might not make sense if you take them word-for-word. They must be learned as a whole. Today, let's look at two such expressions based off the word reek, pronounced [rEYk] like the English word "rake." 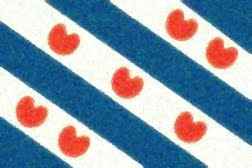 Reek means "smoke" in Frisian. Hy wennet in hiel ein út 'e reek. No wie it gefal dat de pleats wat út 'e reek lei. Now it was the case that the farm was far way. However, we can reverse our meaning by saying that someone or something is "under the smoke." That means it is close by. Marsum is in lyts doarp ûnder de reek fan Ljouwert. Marsum is a little village near Ljouwert. Se is berne yn it doarpke ûnder de reek fan Dokkum. She was born in a village near Dokkum.